Splinter is the seventh studio album by American punk rock band the Offspring, released on December 9, 2003 by Columbia Records. It was the first album the band released without drummer Ron Welty. Although not as successful as the Offspring's previous albums, Splinter received gold certification two months after its release. The album received average reviews, but still sold reasonably well, debuting at number 30 on the US Billboard 200 with around 87,000 copies sold in its first week. "Hit That" and "(Can't Get My) Head Around You" were the only two singles to accompany the album; "Spare Me the Details" was also released as a single, but charted only in New Zealand. After spending nearly two years supporting the Conspiracy of One album, The Offspring began writing songs for Splinter in late 2002. Recording sessions for the album lasted from January to August 2003, making it the first time The Offspring had recorded an album for that long (although their next album, 2008's Rise and Fall, Rage and Grace, took more than a year to record). Uncomfortable with the idea of bringing in an immediate replacement for Welty, the band opted to have session musician Josh Freese play drums for the recording of the album, with plans to find a full-time drummer upon the record's completion. The crowd vocals in the opening track "Neocon" were recorded at Reading Festival in 2002 during the Offspring's set on the festival's main stage. Estimates based on the capacity of Reading Festival would suggest at least 50,000 people are in the crowd. On April Fools' Day 2003, the album's title was jokingly announced as Chinese Democrazy, a reference to the repeatedly delayed Chinese Democracy album by Guns N' Roses. Holland quipped, "You snooze, you lose. Axl ripped off my braids, so I ripped off his album title." The album's title comes from a lyric that appears in "Long Way Home". This is the second and last new studio album to have the skull logo on their cover to date, excluding the Greatest Hits album. It later appeared on their 2012 single, "Cruising California (Bumpin' in My Trunk)". All tracks written by Dexter Holland . There was another song recorded for the album called "Pass Me By". The band felt that it was too heavy for the album, which is why it wasn't included on the disc. It was for a time rumored to appear on The Offspring's next album Rise and Fall, Rage and Grace, but as of its release, the track has yet to surface. Similar to Conspiracy of One, has been given a score of 60 out of 100 from Metacritic based on "mixed or average reviews". Reviewers from sites such as Launch.com claimed Splinter was a welcome return to The Offspring's punk roots, citing songs such as "The Noose" and "Da Hui". The more mainstream songs, "Hit That" and "Spare Me the Details", were also praised. AllMusic's Johnny Loftus also praised punk songs such as "Long Way Home" and "Lightning Rod", and claimed second single "Head Around You" was the album's standout. However, he criticized songs such as "The Worst Hangover Ever" and "When You're in Prison", calling them 'throwaways'. PopMatters also praised "Head Around You", "Race Against Myself", and other heavier songs on the album. However, it also called "Worst Hangover Ever" 'idiotic' and again criticized "When You're In Prison" and "Neocon". They also criticized the album’s short length, calling it “wasted potential". Ronnie King – keyboards on "Hit That"
2002 Reading Festival Crowd – crowd vocals on "Neocon"
Mark Moreno – DJ scratching on "The Worst Hangover Ever"
Phil Jordan – trumpet on "The Worst Hangover Ever"
Jason Powell – saxophone on "The Worst Hangover Ever"
Erich Marbach – trombone on "The Worst Hangover Ever"
Brendan O'Brien – piano on "Spare Me the Details"
Lauren Kinkade – backing vocals on "When You're in Prison"
Natalie Leggett, Mario De Leon, Eve Butler, Denyse Buffum, Matt Funes – violins on "When You're in Prison"
Josefina Vergara - concert master on "When You're in Prison"
Suzie Katayama - orchestration on "When You're in Prison"
Larry Corbett – cello on "When You're in Prison"
Gayle Levant – harp on "When You're in Prison"
^ a b c d Loftus, Johnny. "Splinter - The Offspring". AllMusic. Retrieved 2012-06-04. ^ a b c Williams, Adam (2004-01-16). "The Offspring: Splinter". PopMatters. Retrieved 2012-10-23. ^ a b "Critic Reviews for Splinter". Metacritic. Retrieved 2012-10-23. ^ "The Offspring: Splinter". Alternative Press: 93. Jan 2004. ^ Hocking, Mat (27 January 2004). "The Offspring: Splinter". Drowned in Sound. Retrieved 10 December 2017. ^ Sinclair, Tom (2003-12-12). "Splinter Review". Entertainment Weekly. Retrieved 2012-03-04. ^ Hoard, Christian (2003-12-10). "Splinter : The Offspring : Review". Rolling Stone. Archived from the original on 2008-06-18. Retrieved 2012-04-09. ^ Brackett, Nathan; Hoard, Christian, eds. (2004). The New Rolling Stone Album Guide. Simon & Schuster. ISBN 0-7432-0169-8. ^ Beaujon, Andrew (2003-12-08). "The Offspring, 'Splinter' (Columbia); blink-182, 'blink-182' (Geffen)". Spin. Retrieved 2012-10-23. ^ Gundersen, Edna (2003-12-08). "The Offspring, Splinter". USA Today. Retrieved 2013-01-20. ^ Joe D'Angelo (2003-12-17). "Ruben Debuts At #1 But Can't Match Clay's First-Week Sales - Music, Celebrity, Artist News". MTV. Retrieved 2012-01-12. ^ "The Offspring History (Official Website)". The Offspring. Archived from the original on 2011-06-23. Retrieved 2012-06-04. ^ Henry Yates (November 19, 2008). "33 insane facts about Chinese Democracy". MusicRadar. Retrieved March 14, 2012. ^ "BMI Entry". Repertoire.bmi.com. Archived from the original on 2015-10-16. Retrieved 2012-06-04. ^ "OLiS: sales for the period 1.12.2003 - 07.12.2003". OLiS. ^ "ARIA Charts – Accreditations – 2004 Albums". Australian Recording Industry Association. ^ "French album certifications – Offspring – Splinter" (in French). Syndicat National de l'Édition Phonographique. ^ "The Official Swiss Charts and Music Community: Awards (Offspring; 'Splinter')". IFPI Switzerland. Hung Medien. ^ "British album certifications – Offspring – Splinter". British Phonographic Industry. Select albums in the Format field. Select Silver in the Certification field. Type Splinter in the "Search BPI Awards" field and then press Enter. 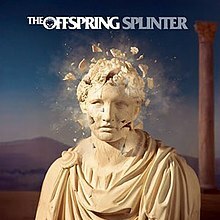 ^ "American album certifications – Offspring – Splinter". Recording Industry Association of America. If necessary, click Advanced, then click Format, then select Album, then click SEARCH. This page was last edited on 9 April 2019, at 16:49 (UTC).